Online marketing firm, Oneupweb, leads industry with two wins and four nominations in four years — voting on finalists ends Nov. 8. Continuing its industry record, Oneupweb, a leading national search engine optimization (SEO), paid search marketing and podcasting firm, today announced it has been nominated a finalist—for the fourth time in four years—as Best Search Engine Marketing Vendor by ClickZ's readership. Oneupweb has won the Best Search Engine Marketing Vendor category in ClickZ's Marketing Excellence Awards twice in the last three years. The ClickZ Marketing Excellence Awards recognize ClickZ readers' choices for achievement and innovation in online marketing technology, solutions, and execution. "Every year, this award becomes even more valuable to us," says Lisa Wehr, Oneupweb CEO. "Since the last presentation of this award, our industry has changed. There are hundreds more search marketing companies and several firms were purchased by global advertising agencies with considerable resources. To compete against this changing landscape, Oneupweb continues to focus our efforts on client service and success—not chasing venture capital or stock market fantasies. And we continue to challenge ourselves and our clients to higher standards of online success. It shows in the longevity of our client list, their glowing testimonials and their results." Wehr says, "To stay ahead, we added more services and invented new technology. We've provided clients with the broadest line of online marketing services with exceptional expertise in leveraging search engines. And just this summer we were the first of our industry to add corporate podcast production and tracking. "Our focus is always on client service, innovative technology and insightful industry leadership," continues Wehr. "We're honored to be chosen a finalist again, and believe that our consistency in being named a finalist may be credited to the reputation we've earned in the marketplace." These prestigious ClickZ Marketing Excellence Awards recognize ClickZ readers' choices for achievement and innovation in online marketing technology, solutions, and execution. The Best Search Engine Marketing Vendor nomination process narrowed potentially thousands of candidates to just three firms. Voting continues now through Wednesday, November 8, 2006, and winners will be announced on Monday, November 13, 2006. Oneupweb offers a variety of online marketing services, from natural optimization and paid search and podcast production, to search behavior research, PR services and international promotion. The firm is often cited in newspapers, magazines, and websites, and it regularly publishes ground-breaking white papers, articles, and studies about the search marketing industry. It also publishes OnlineMarketingBrief.com., an industry-leading e-newsletter, StraightUpSearch, a blog and podcast on timely search industry insider insight, and Integrated Online Marketing (iOM) a podcast series making Oneupweb's white papers and research portable. "Oneupweb's number one goal is to meet clients' needs for better online performance," says Wehr. "Staying focused on our clients will always be our primary objective. Great things happen when you put clients first." Incisive Media, parent to the ClickZ Network, is a fast growing specialist business information provider operating in eight core markets, financial risk management, retail investment, insurance, mortgage , capital markets/financial IT, marketing, photographic and Private Equity. The Group delivers key information to defined target audiences across a variety of platforms including magazines, conferences and exhibitions, websites, newsletters, contract publishing and databases. ClickZ has a mission to help interactive marketers do their jobs better. The ClickZ Network is the largest resource of interactive marketing news, information, commentary, advice, opinion, research, and reference in the world, online or off-. From search to e-mail, technology to trends. The coverage is expert, exclusive and in-depth. Oneupweb has been an innovator in online marketing for more than a decade, creating integrated online marketing plans that include natural search engine optimization, paid search marketing, podcast production, online market research, marketing analytics and more. An award–winning firm, Oneupweb was named a 2006 Michigan Top 50 Company to Watch and is the only two–time winner of the prestigious ClickZ Best Search Engine Marketing Vendor Award. 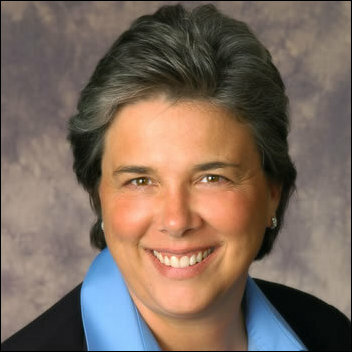 CEO, Lisa Wehr, an Ernst & Young Entrepreneur of the Year, has been named to BtoB Magazine's Who's Who List three years and is recognized as a Leader & Innovator by Lawrence Technological University. The company publishes an SEO / SEM newsletter Online Marketing Brief™ and a blog and weekly podcast named StraightUpSearch. Oneupweb is a privately held company located in Michigan. For more information on Oneupweb, please contact 231.256.9811 or visit Oneupweb.com. 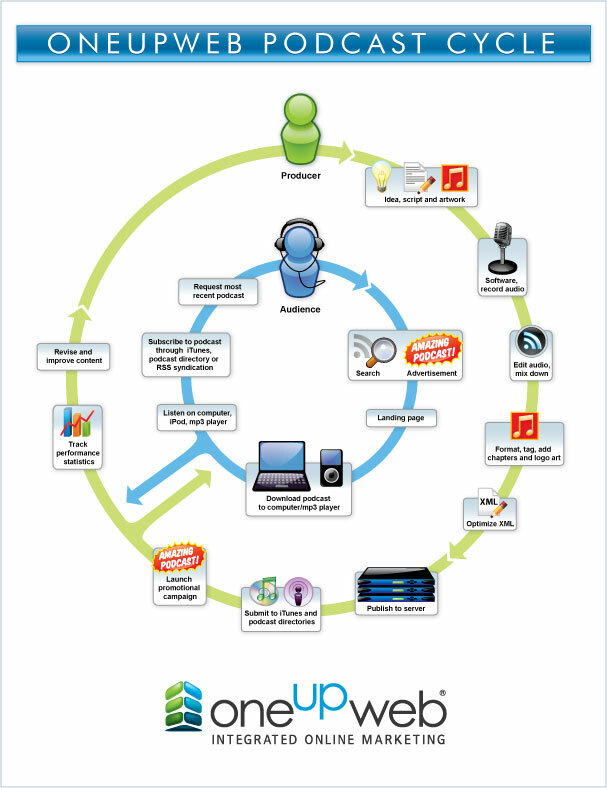 Oneupweb Logo Oneupweb Podcast Production CycleOneupweb produces several industry white papers, articles and other resources like this graphic representation of podcast production best practices.